Ernie Bishop, USA dealer for SEB Coaxial, offered this story about teaching a young boy how to shoot — passing on the heritage of marksmanship to the next generation. Ernie was working with an 8-year-old novice. With Ernie showing him the ropes, the young man was able to make hits at 1440 yards! Share the post "Teaching the Next Generation — Ernie Bishop’s Protégé"
“Where is all the .22LR ammo?”, “Where did all the rimfire ammo go?” — it seems that litany is all we hear these days. We’ll here’s something to quiet those voice of discontent. Grafs.com currently has quality 40-grain SK-brand .22 LR ammo in stock. You can get a 500-count brick (10 boxes) ammo for $56.99 (Item #: RSK420101B). Or you can get a 500-round can of 40gr ammo for $54.99 (Item #: RSK420121). There is a limit of 1000 rounds per customer per ammo type (i.e. a customer may order no more than two bricks of boxed ammo, AND two 500-count cans). If you want to sample other types of SK rimfire ammo, individual boxes of SK “High Velocity”, “Rifle Match”, and “Subsonic” ammo are also in stock at Grafs.com (with prices about $8.50/box). SK rimfire ammo is made in Europe. SK Standard Plus is not benchrest-grade ammo on a par with Lapua Midas+ or Eley Tenex. However it is much, much better than most general purpose rimfire ammo. SK Standard Plus is good enough to win a rimfire tactical match — we can attest to that from our own experience. This is much better than bulk-pack fodder (if you could even find that). Share the post "Grafs.com Has SK-Brand .22 LR Rimfire Ammo Available"
For the next four (4) days, Harbor Freight is offering some very attractive Coupon Specials. First, with the coupon below, you can get 20% off the purchase of ANY item on HarborFreight.com or sold in one of the Harbor Freight stores. Interested in a big-ticket item? Then use your 20% off coupon. Along with the 20% off coupon, Harbor Freight is offering some handy items for FREE with any purchase. Grab a free LED flashlight for your range bag, or pick up a free power strip for your loading bench. If you need a general purpose bench with drawers, Harbor Freight has a great deal right now on a metal-framed, lighted utility bench. With Coupon Code 73007230, this bench, normally priced at $149.99, is just $79.99. NOTE: We don’t think this workbench is strong/rigid enough to serve as a primary reloading bench. However, it CAN serve many functions in your loading room, such as holding gun-cleaning cradles, vibratory tumblers, annealing machines, and general reloading gear. The built-in overhead light is a nice feature. And there is a full width shelf on the bottom which is good for holding shipping boxes and other items that are bulky (but not too heavy). Share the post "Labor Day Weekend Sale at Harbor Freight"
How would you like to get an exclusive Leupold-logo jacket? From September 1 to October 15, 2014, Leupold will send a limited-edition Carhartt jacket to everyone who buys an American-made VX-3, VX-3L or VX-6 riflescope. OFFER Details. Those of us who own Leupold scopes (this Editor has four), know that the company stands behind its products 100%. The Leupold Full Lifetime Warranty is justifiably famous. For the life of the product Leupold will either repair your Leupold product or replace it free. No escape clauses, no BS. And warranty coverage is not limited to the original owner. I’ve had Leupold fix “previously owned” Leupold riflescopes no questions asked. That’s a great reason to trust in Leupold. Share the post "Leupold Offers Carhatt Jacket to VX-3, VX-3L, and VX-6 Buyers"
Share the post "Borescopes — What They Reveal May Surprise You"
Top Shot Season 4 Champion Chris Cheng has written a new shooting skills book, Shoot to Win. This book is designed primarily for new shooters looking to master basic techniques. However, it also provides tips for all competitors, no matter what their skill levels. On the Top Shot TV show, Cheng was able to beat many more experienced marksman because he was smart, he trained methodically, and he had excellent fundamentals. He showed the world that a relative novice with proper training can prevail in head-to-head competition over more experienced shooters who may have acquired “bad habits” (technique flaws) over the years. Chris Cheng won the title of “Top Shot,” a $100,000 cash prize, and a professional shooting contract. How did a tech support guy with limited shooting experience beat out 17 other competitors — including military snipers, police officers, and seasoned shooting pros? Well, that’s the question this book answers. Cheng covers his approach to staying calm under pressure, teamwork, sportsmanship, and leadership. Chris was excited about his new book: “Shoot to Win is coming out October 7th! This has been almost two years in the making….” The book is primarily a treatise on beginning rifle, pistol, and shotgun marksmanship. The book also how explains how Chris trained for, and then won the Top Shot competition. If you are interested in Shoot to Win by Chris Cheng, you can pre-order the hard copy book at Amazon.com right now (for October 7, 2014 release). An eBook version will be coming out later this fall as well. 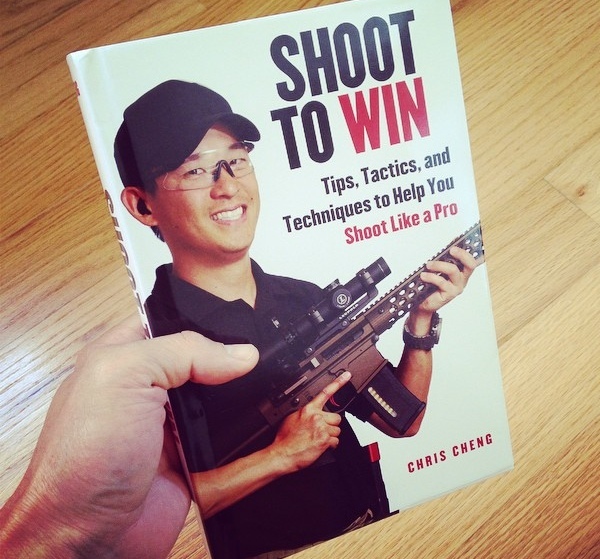 Share the post "Shoot to Win Book by Chris Cheng Coming Soon"